The "Nefeli" hotel is located on the 2nd Km. of National highway Kozanis - Ptolemaidas between Egnatias Avenue and Kozanis City. 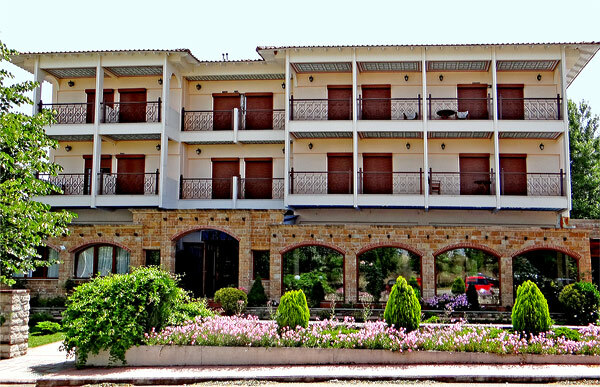 "Nefeli" is a beautiful traditional Hotel made out of our own personal taste, in a lovely, unique green environment. The hotel has 38 spacious rooms including 2 double spaced suites. There is ample space for relaxation and a bar. During summertime the open-air café works beside the secure area of ​​an acre playground. In winter time you can enjoy the warmth next to the fireplace enhancing the sense of the cozy welcoming atmosphere of the hotel. Also Wi Fi is available in indoor and outdoor areas of the Hotel. The rooms are facilitated with air conditions and hair dryers. A huge parking plot can accept both cars and buses. All the comforts in combination with the high level of services will offer you a pleasant accommodation.